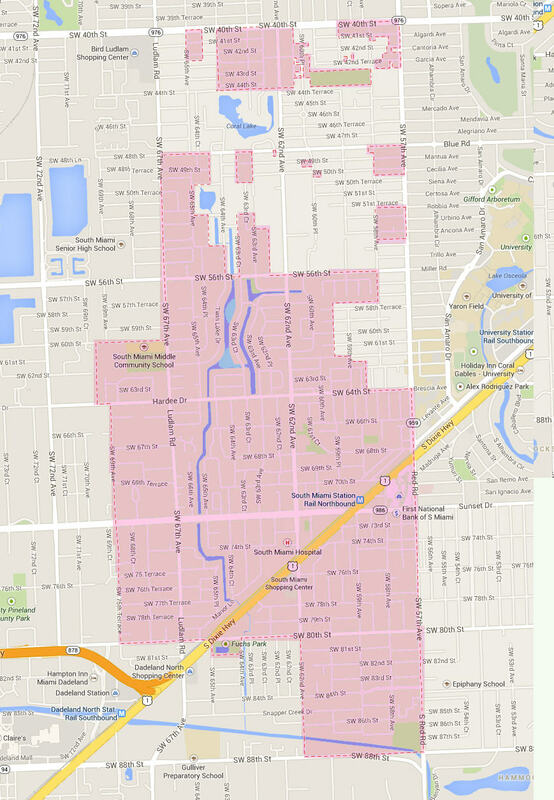 South Miami, known as The City of Pleasant Living, was incorporated on June 24, 1927. The city’s founder, Wilson Alexander Larkins, brought his family to South Florida, where he started a small dairy and later established a post office near what is now Cocoplum Circle. Native Americans (Tequesta, Calusa and Jaega) had roamed the area for centuries, before pioneers reached Little Hunting Ground, now known as Coconut Grove, and Big Hunting Ground, known as Cutler. By 1906, Larkins bought land west of now Red Road and South of Sunset Drive to establish the first grocery and general supply store located in the area. The real estate boom of the Roaring 1920s had impacted the area and the population increased drastically, with land values reaching an all-time high. The hurricane of 1926 greatly affected the Town of South Miami which did not receive federal assistance and lost its only fire station to the storm. Citizens of South Miami were displeased with the municipality’s status as a “Town”, feeling it was being overlooked by the State and Federal Governments. When the town was incorporated in 1927, it ceased to exist as the Town of South Miami, and became known as the City of South Miami. South Miami’s total area was first reduced in 1933 to lessen municipal responsibilities and again in 1937 after many unsatisfied northern inhabitants sued out of the city, which explains why there are irregular boundaries in South Miami today. In the City of South Miami, there are many places to visit such as The Shops at Sunset Place, a grand outdoor mall featuring shops, movies, dining, and entertainment for everyone. There are restaurants in every corner catering to all types of cuisine. Small local boutique shops and well known retailers, as well as other businesses are also available. This area is pedestrian friendly and everything is walking distance. South Miami is also bordered by Coral Gables and Pinecrest, which have plenty to offer for everyone. There are several parks that can be visited in the City of South Miami. Some of these parks include Van Smith Park, Palmer Park, Murray Park, South Miami Park, Jean Willis Park, and All-America Park. Palmer Park offers a football/soccer field, concession stand, playground with children’s area, and six baseball fields. Murray Park has a multi-purpose field, two lighted basketball courts and a t-ball field. South Miami Park has athletic playing fields, youth and adult sports leagues. Jean Willis Park is perfect for relaxing with green scenery and a large gazebo. All-America Park is also another great park for relaxing and has picnic tables and native trees. Some of the schools in the City of South Miami include Ludlam Elementary, South Miami Elementary, South Miami Middle School, Sunset Elementary, Gulliver School South Miami Campus, Our Lady of Lourdes Academy, and Sunset Montessori School. Ludlam Elementary is recognized for being an A-rated school and recipient to several awards. The school was built in 1958 and named after Walter H. Ludlam, one of the pioneers during the early days of the development of Miami. Sunset Elementary is known for its language magnet program of international studies. The school is a controlled choice school. Controlled choice allows school districts to make student school assignments using parents’ indicated favored school choice. Should a student not be placed at the favored school, they will be placed on a waiting list. Our Lady of Lourdes Academy is an all female private school grades 9th-12th. The school was founded in 1963 by Msgr. Bryan Walsh to educate Cuban refugees who were in the care of the Catholic Welfare Bureau. South Miami is filled with history from the early years of the formation of Miami. It is a great area to live for families as well as those that enjoy the night life by The Shops at Sunset Place. The City of South Miami is appealing to everyone for all that it has to offer. If you have any interest living in South Miami, contact us and we will assist you with your real estate needs.